In 2005 the United States closed the doors of the last remaining horse slaughter plants, establishing the nation as a model for parts of the world that still value horse meat as a delicacy. Now the USDA would take the nation backwards by processing applications for inspections that would reopen horse slaughter facilities. 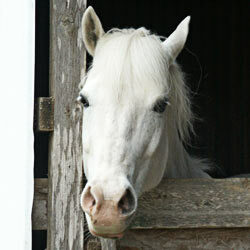 Opinion polls reveal that 80 percent of Americans are opposed to horse slaughter of any kind. The practice is inhumane for the horses involved, produces meat unfit for human consumption, and wastes millions of taxpayers’ dollars — all so private companies can cash in on a lucrative foreign market. And because younger, fitter horses fetch much higher prices at the market, approximately 92 percent of horses going to slaughter are healthy and capably of leading productive lives. Horses are our companions and deserve better. Sign the petition and demand the USDA reject all applications for inspections of horse slaughter facilities. November 2013: 10th U.S. Circuit Court of Appeals in Denver issued an emergency injunction, blocking the proposed plants from opening. August 2013: Horses won a temporary reprieve when a federal judge issued an injunction on August 2, preventing the USDA from conducting the requisite inspections. July 2013: In a shocking betrayal of public trust, the USDA granted an inspection license for a horse slaughtering plant in New Mexico, setting a terrible precedent for the remaining applications. June 2013: Appropriations committees in both the U.S. House and Senate voted to halt all funding for horse slaughter in FY 2014. April 2013: President Obama included a specific request in his proposed budget for FY 2014 to block spending on these inspections. March 2013: Safeguard American Food Exports Act, H.R. 1094 / S. 541, would take the extra step of ending the export of American horses destined for foreign slaughterhouses. So, even if these inspections move forward, they face severe legal and legislative obstacles in the coming year, making any inspections a waste of taxpayer money. Continue pressuring the USDA to bring its policies back in line with the American public. The Humane Society of United States and The Fund for Animals rescue horses around the country from harsh treatment by the BLM, cruel practices by pharmaceutical companies, and abusive situations, and gives them a new life at one of the Fund's sanctuaries for rescued animals. Help feed and care for a rescued horse. Low-cost gelding clinics can help responsible horse owners facing tough times properly care for their colts and stallions. Since each stallion creates an average of five offspring in his lifetime, gelding can help reduce the future horse population to a more manageable level %mdash; ensuring a brighter future for the next generation of these noble creatures. Support low-cost gelding. Providing feed to responsible owners so that they are able keep their beloved horses safe at home is the goal of this program. This will help alleviate pressure on the already overburdened rescue community, and will prevent the horses from being neglected, abandoned, or sold to slaughter. Help keep a horse at home. I am one of the vast majority opposed to horse slaughter. As such, I am dismayed to learn that the USDA is processing applications for inspections of horse slaughter plants. First and foremost, horse slaughter is inhumane for the horses involved. Younger, fitter horses fetch much higher prices at the market. Consequently, the USDA’s own reports reveal that approximately 92 percent of American horses going to slaughter are healthy and capable of leading productive lives. Further, horses are our companions and deserve better. They have served beside us on battlefields and to this day help keep our streets safe as members of mounted police units. And public opinion polls reflect this reality: 80% of Americans are opposed to horse slaughter of any kind. In addition to being inhumane, horse meat is unfit for human consumption. Because horses are not bred for consumption, horse tissue may contain substances dangerous for human health. And the byproducts of the slaughter process contaminate the surrounding environment. Finally, the USDA would squander taxpayer money during a time of fiscal recovery. Federal inspections require federal funding, all so private entrepreneurs can cash in on a lucrative foreign market. As the head of the USDA, I ask that your organization reject all applications for inspections of horse slaughter facilities. That's 115,201 signatures! Let's keep the ball rolling.